Kinetic Kracker Cup + Rubber Catches - Black Walnut Cracker for Serious Nut Crackers! Our Kinetic Kracker electric pecan cracker is manufactured with a steel anvil and aluminum pecan cracker cup so you have the perfect mix to ensure a near perfect nut crack every time without pulverizing the delicious nut meat. Over time, or with use of your Kinetic Kracker electric pecan cracker without the right nuts always in the shoot, the steel anvil can wear down and flatten the aluminum cracking cup. This will make your electric pecan cracker work less efficiently and effectively, then you will have to do more of the hard work. To lengthen the life of your electric nut cracker cup make sure you run it minimally without pecans in the shoot. Our Kinetic Kracker electric pecan crackers are manufactured to last nearly a lifetime, but having a back up Kinetic Kracker electric nut cracker cup is always a great idea. 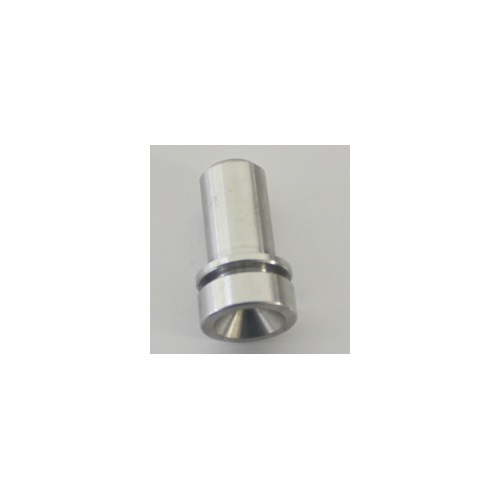 This aluminum pecan nut cracker cup will work on ANY electric nut crackers that we offer.